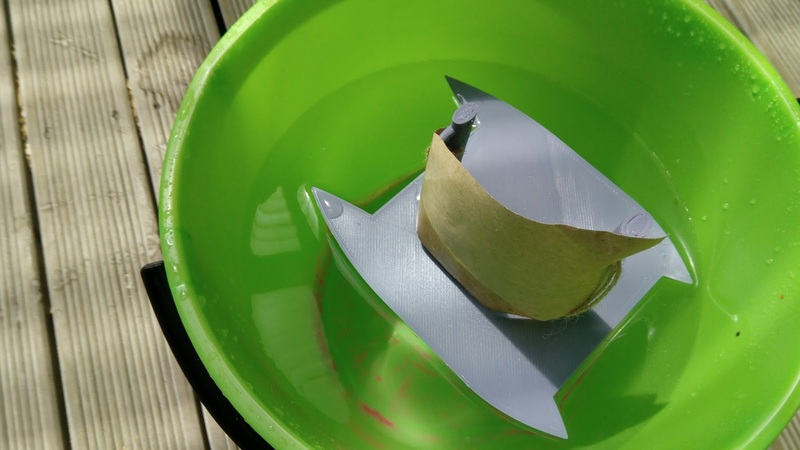 Challenge: To produce a working model of a boat that would be powered by and engine or sail. Background: Following extensive testing of the initial prototype discussed in the previous two posts the student concerned decided to redesign the base of the catamaran, removing the centre piece and attemping to show a more traditional catamaran style. The student concerned in this series of prints related to this project is a ten year old, who has shown considerable skill with the design and creation of a number of school projects during the course of the year. 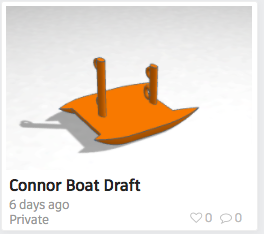 The initial design featured in the previous print came about as he discovered a 'hull' basic shape had been added to the Tinkercad basic shapes interface. This led to a discussion about creating a 3D Printed model boat. 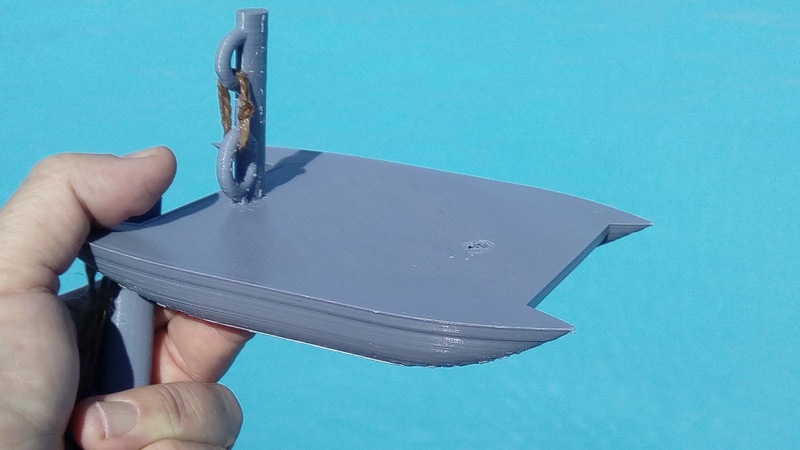 Extensive testing has shown the PLA to be ideal in water situations, the buoyancy proving to be excellent in allowing a boat shape to sit perfectly in the water, this updated version even more so than the original. The original design featured masts - this revised version did not, as the masts in the first version were purely cosmetic. One key element that will need to be addressed is the mounting of the motor to power the book. A custom made piece will need to be printed and designed (altering the above shape) to house the motor and prevent it from getting wet. Level of Difficulty - Medium, essentially this task has been about completing a prototype basic structure and to test the viability of printing with PLA in 3D, this has been a resounding success, however the level of difficulty is to increase significantly as additional features are to be added to the shape to include masts and a housing unit for the motor, to successfully add these features will be a challenge. 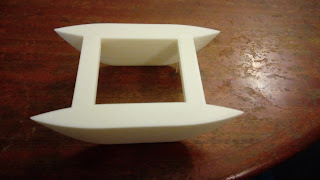 Time frame: Redesigning the hull of the boat, and making the changes that were made from the initial print has also significantly altered the time to print the model. The first version took ten hours, the V2.0 time (again with 8mm nozzle, standard Ultimaker settings) was seven hours, and potentially could have been reduced further relative to the depth of the hulls. Size: Each hull was 15cm long and 5cm deep, they had a thickness of 2cm. The bar to join the two hulls together are 8cm across, 5mm thick and started three cm from the bow and stern of each hull. What would we do differently: the students are enthusiastic and really seem to be onto something here. The basic design has again exceeded the brief. The boat itself as noted previously seems extremely stable and is not easily able to be flipped - we have continued testing it by dropping it from heights up to two metres and the boat continues to float, hence we would do little differently at this point. 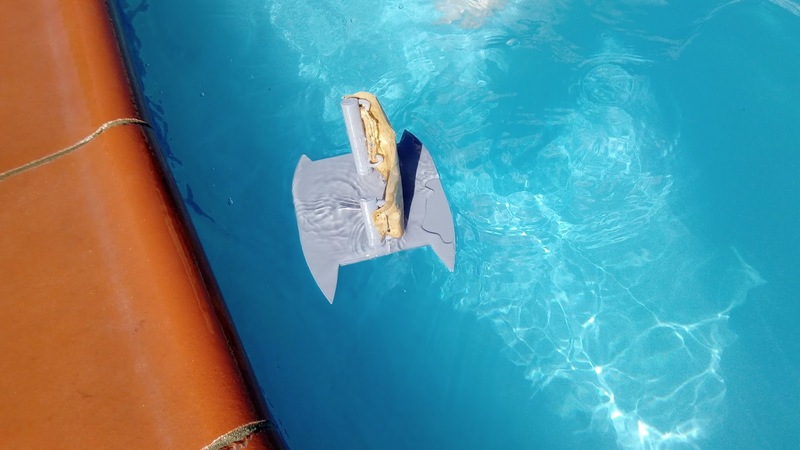 Next steps for students: The designs greatest challenge will be incorporating a power source successfully to act as a way to propel the boat while in water. The students have the possibility of using a sail in some capacity although this will complicate issues relating to the material that the sail is made from. 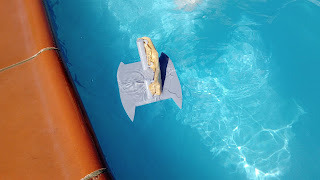 Following the success of the previous print, of the model of the Catamaran Boat Model the student (ten years old) who crreated the 3D Printed model boat decided to 'road test it' by floating it in the school swimming pool, to test its ability to float. As mentioned in the previous print detials the sail was for comestic purposes only, as it was made using paper. all. Water covered the top of the design, however it 'washed' off allowed the boat to remain bouyant. We further tested the boat by throwing or dropping it into the water from 1m to 2m height and then skimming it as far as we could 'flip it'. During this level of testing the boat would not sink or tip, it simply comtinued to float. If the boat was delibrately flipped and turned upside down it would remain in this state. The damage shown to the mast left occurred when a student flicked the design, and it hit directly the edge of the pool. This caused the mast to break off (as shown). However while the mast itself would sink when held below the water, the base of the boat would not even when it was held underwater on the base of the pool. 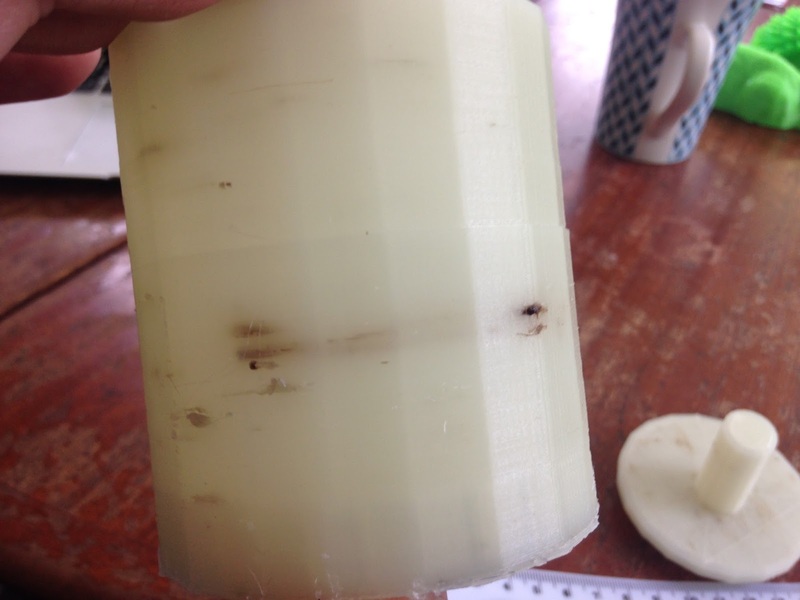 Given all the testing that was carried out in the last two days the design is practical in terms of its water durability and water tightness, a regular print will not sink as the PLA continually refloats. This design as shown while it is basic represents the first basic print and design in the series. The inention is for the students to design, manufacture and mount a motor onto the boat to allowed it to be semi-powered which will provide the next challenge for students. Above: Original design from Tinkercad. 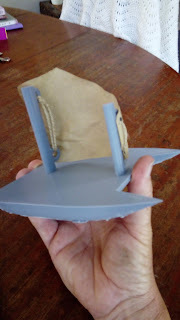 Challenge: For student to produce a working model of a boat (in this case a catamaran). Background: Tinkercad as a version of software are continually evolving and looking at producing new ideas, which are released as part of the design software. A student from my class who is ten years old was able to locate the new design features and located the 'boat hull' design template. The student concerned has a talent for design and engineering and is forever tinkering and creating projects, which is a great strength of his. In this example he was fascinated with the prospect of creating a boat. It was reasoned that by 3D Printing the hull that the boat would be able to float, or should be designed to do so, including problem solving to ensure that it was a workable model. This is the students first draft attempt at completing a boat. He has already looked on Youtube to develop possibilities for a working motor that would work in conjunction with the boat. The first task was to complete the hull, test it to ensure that it would float, and look at altering the dimensions, print settings etc to ensure that this was possible. Level of Difficulty: Medium, the hull design needed to be workable (see below) which would allow more advanced features to be added. While the hull template came from Tinkercad the decision was made to create a catamaran for the balance that it would provide for the base. At this stage we were still investigating the best way for the boat to work. The sail shown on the right hand side was for decorative purposes as the decision has been made to look at including a motor to power the boat. Timeframe: The total print time for the base of the catamaran was ten hours. There was minimum rafting with the print, the masts were having a cosmetic effect, so they could have been resized. The base of the catamaran was designed to provide stability to the print, first and foremost. The nozzle was 8mm and the print setting was 'regular'. Size: The length of each hull is 18cm. The width is 2cm and the height was 2cm. The middle of the catamaran was essentially a 12cm by 8cm rectangle, with a depth/width of 5mm. The smaller mast was 9cm high and the second smaller mast was 6cm. 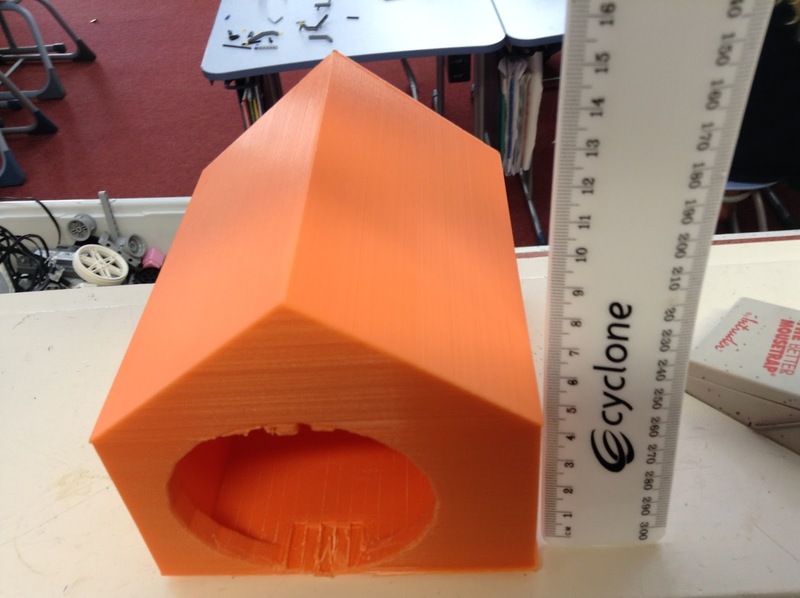 Given the purpose of the print is to have a motor fitted at the back to power the boat, the dimensions are about the minimum that is required. Printing for our students (which has ironically come in the last regular week of school). The boat design required specific requirements with the intention of a motor being used to power the boat. 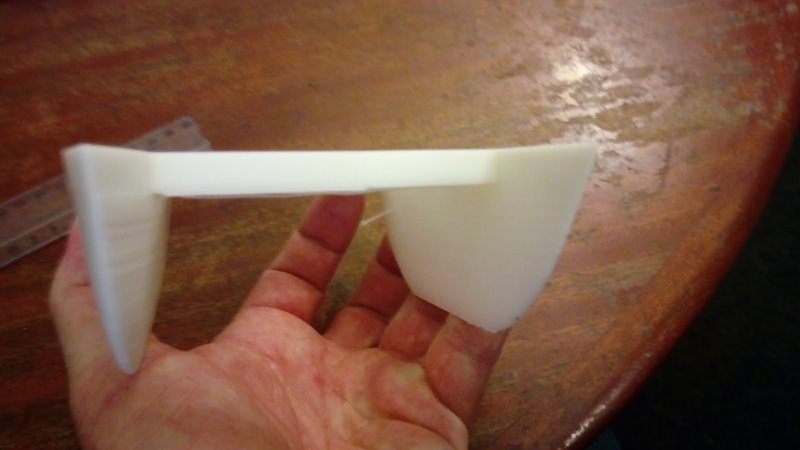 Given the success of the initial print (we were not even sure if the PLA used for the 3D Printer would actually float, or we would need to hollow out the inside of the hull). Going forward there will need to be a location for the motor to be housed on the design. Next challenge for the students: The sails of the prototype are purely cosmetic, the students could consider using a fabric that might have a practical use. The dimensions of the catamaran seem correct at the moment, however this will be dependant on the size of the motor, and how this will relate to the design. We are currently sourcing a motor at the moment which will require the design to be revisited. We will be water testing the design over time. Challenge: To produce a personalised stand for the hanging of an important item of jewellery. Background: Student was looking at creating an individual project. She had a family member that has a specific piece of jewellery, and this item requires a specific location for it to be held. 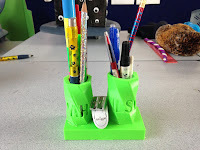 The student wanted to create an individual and personalised stand for the item. 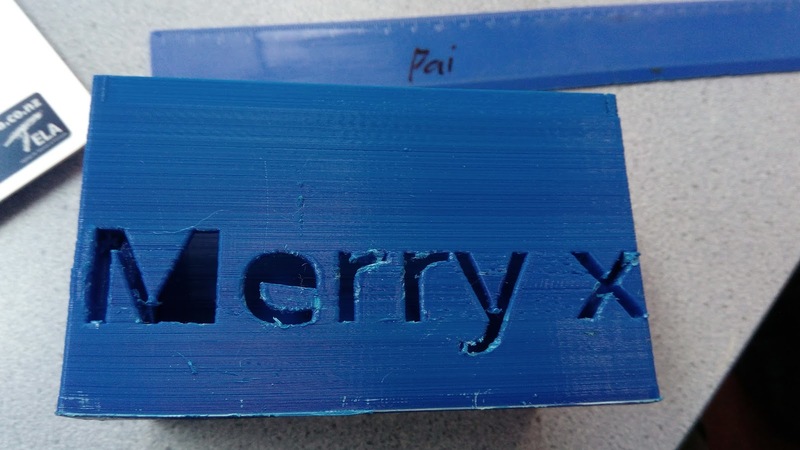 They had seen similar projects created in class and felt the 3D Printing aspect of it would meet the brief and produce a unique product that would also double as a christmas present. Level of Difficulty: Low/medium - the basic design was created from the main interface. The idea was to have an extension to the design where the jewellery could hang from. Timeframe: Five hours from completion from regular print settings with a 8mm nozzle, the revised version will take longer (see below). Size: 12cm in height. The base in the present version is 4cm across and 3cm wide. This design is in the process of being re-worked thanks to feedback from the first draft print. The lettering design worked, as did the shape design. The areas that need to be addressed are the base plate - which there isn't one. As a shape the design is relatively stable however it is easily tipped over. 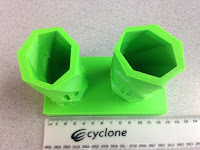 As a result the student is designing a revised version of this print that included a base plate to allow more stability. The aspect of the print designed to hang the jewellery needed to be longer to ensure that the jewellery could be held more easily. The student also decided that they needed to increase the overall size of the print as well. This is currently being redesigned. Next Steps for Students: Redesign base, arm to hold jewellery - test the prototype with hanging an object of similar size to the jewellery it has been designed to hold. Challenge: Students to produce a working sample model container for a business that they are running. Sample container needs to hold a variety of liquids and other items that the business could potentially produce - the students were still developing a business model and idea when they decided to work on the containers. Background: The students had shown an interest in running a small scale business (they are ten years old) they had limited experience with 3D Printing, and took some inspiration from the class next door who had produced mock up models of these for a project evening where the parents and the local community came to view the students term work on display. Their intent was to produce a container that could hold a sample of product that they were looking at producing such as lip balm or other cosmetics. The successful construction of a container that would be water tight and potentially sealed would allow a variety of products to be produced. Level of Difficulty: Low - the print consists of two parts, with a hollow out centre. The shape is obviously heart inspired and was created using the Tinkercad main interface. There was potentially additional features that could have been added (see below). 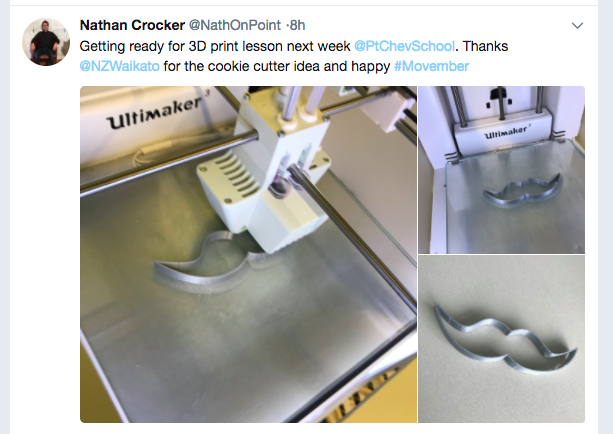 Both students had experience in 3D Printed in the classroom this year and we looking to extend themselves by creating this project from scratch without the input of others. Timeframe: Three and a half hour total print. The lid as shown has a significant hole in it, which allows the product inside to be easily viewed. The base was hollowed out to allow the container to hold liquid and 'product'. Additional features could potentially be added (see below). Size: The box is 8cm across, has a length of 6cm and is 4cm high. The width of the sides of the box was 5mm. The depth of the lid likewise was 5mm. 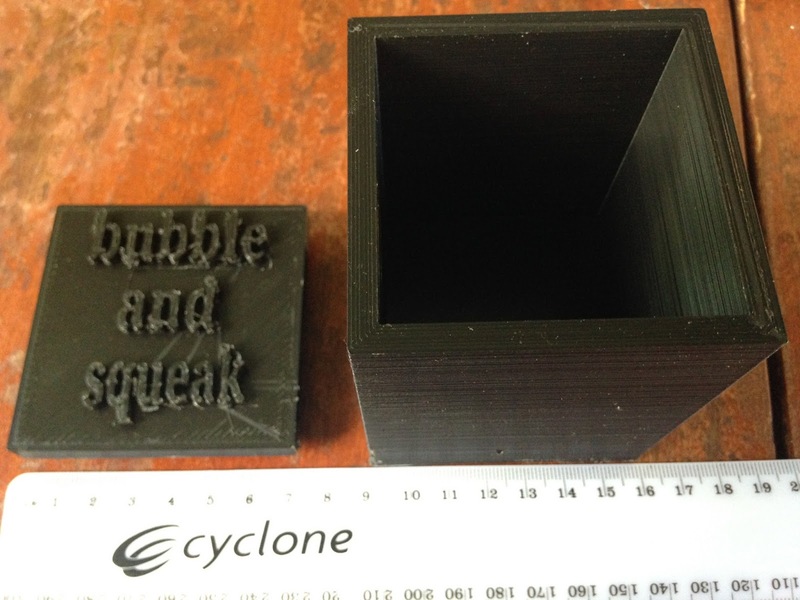 What we would do differently: Nothing (again see below) the print worked exactly as was intended. The students were wanting the package to guide their products and influence what they were able to manufacture. Next Challenge for the students: The business that they are developing could have its name, or the initials of the business inserted into either the lid or the base. 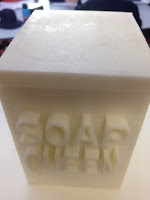 The students contemplated doing this however there have been some issues with lettering etc on smaller prints (and again we were using a 8mm nozzle not a 4mm which could have potentailly improved the detail but would have significantly increased the print time). Challenge: To produce a sign for display as part of a group display. Background: Students had a display as part of a cluster of schools and students display for a local evening. Students were looking for ways to display thier work with something creative and original- that would also be eye catching. Level of Difficulty: Low. 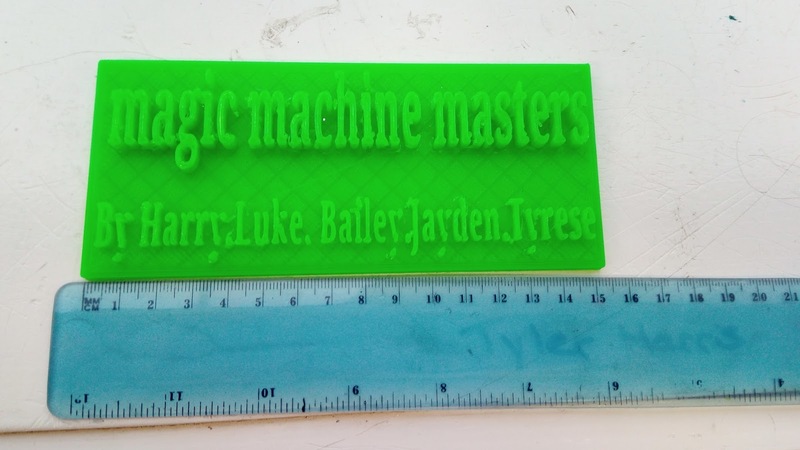 Students were able to produce this sort of thing extremely easily - it was created with the basic interface available from Tinkercad, with simply the lettering overlaid over top. This typical design would expect to be created in a two minute timeframe - which all students in the classroom (Y5/6 - ten year olds) are capable of this. Timeframe: Six hours - this print could have been radically altered depending on the depth of the lettering and the font. The students raised the lettering 5mm from the base of the plate, this easily could have been reduced to reduce the print time, to still maintain the affect. Size: The base plate was 15cm across and had a height of 6cm. The depth of the plate was 5mm and the lettering was raised a further 5mm from the base of the plate. What we would do differently: The choice of the font with the lettering was basic, and the letting itself was not as clearly defined on the base of the 'y'. The students also hadn't used the capital 'm' for the lettering, which they should have done. Potentially the students could have designed holes for screws depending on what it was to be attatched to. Next Stepts for students: To use a font that better suited for the display of the sign. They could have included photograph/images related to the topic as part of the sign. Challenge: To produce a working watch stand suitble for the storage of a worn watch. Level of Difficulty: Low - the design shown above has the three key elements. The student designed the base, sides and main bar in under three mintues. 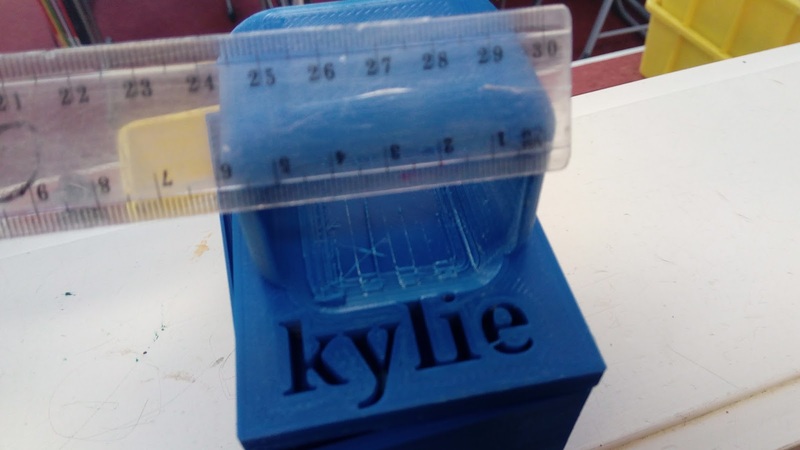 The dimensions took slightly longer however the student wanted to print the design first, to see how it looked before adding any additional features (see below). This sort of design should be easily completed by students of any age. 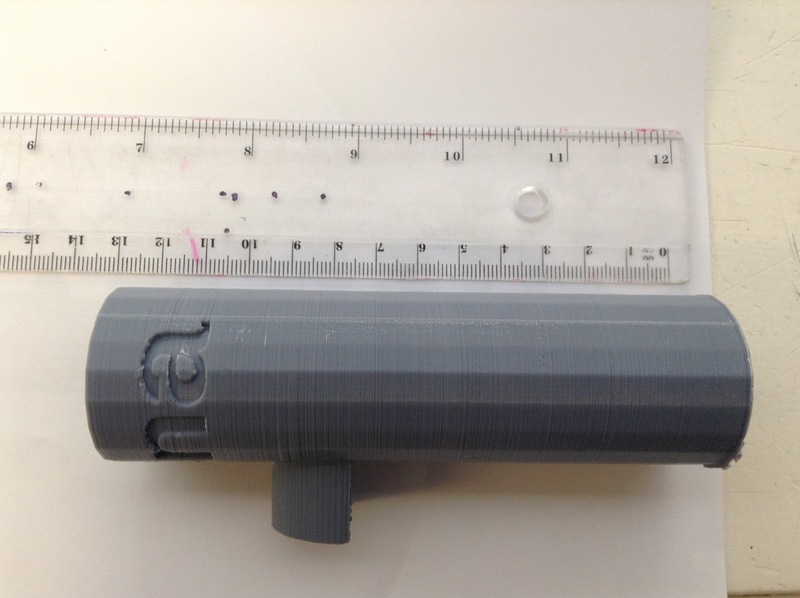 Timeframe: The design took ten hours on a regular infil setting and as with every recent (2017) design on this blog was completed with a 8mm nozzle. 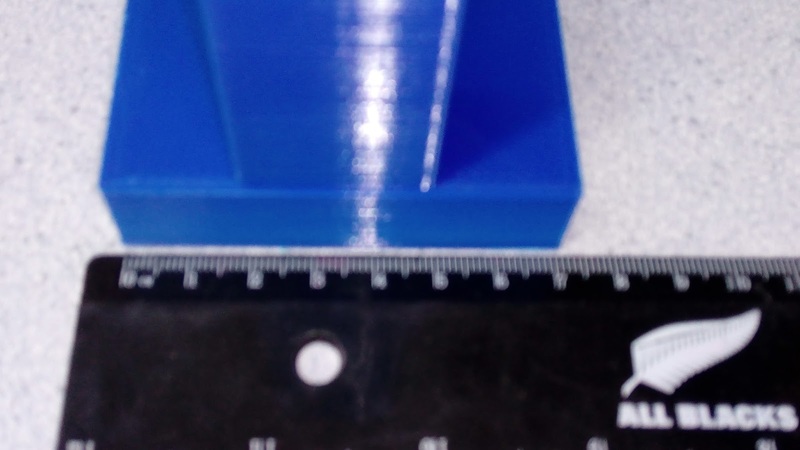 As an aside I personally visited a school last week who had an Ultimaker 3 and had completed a first set of prints, I would hesitate to suggest based on the speeds etc that they were using a 4mm nozzle and high infill settings - this was going to prove to be extremely problematic moving forward for a class/school situation. Size: The base plate for the design was 14cm across and 7cm wide. It was a height of 9cm. It was discussed during this print that a similar designed Headphone stand would be worth investigating for a future work project/design. The width of the plate was 5mm. What we would do differently: This student was intent on running a print prior to discussing the adding of personal touches to the print - the obvious basic one was a name on the plate or the side of the design, which would have had minimal design required. The most pleasing aspect of the design was that ever aspect of the design came from a ten year old who had identified the problem, a soultion, came up with a practical design that worked and the featured print was the first attempt. Next Steps for the Students: Personalising the design is the obvious one that has already been discussed. We are investigating the practicality of creating some form of headphone stand or wall mount, although the size may vary. Also discussed student adding a draw, into the base of the design which has him thinking of ways to complete it successfully. 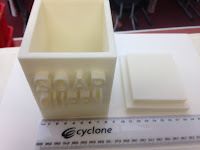 Challenge: To produce a personalised box, that has a working lid and been personalised for a student to give as a gift. Background: This student has designed a series of increasingly complicated prints, during the course of the year. He was looking to push and challenge himself, hence some of the features that were added to the design of this box. Level of Difficulty: Medium-Hard. The box itself required considerable reworking and redesign. It had a series of personally designed features to make the box unique but also allow it to be recognisable. The lettering that was set into the base of the box, the lid and the drop down nature of it, the internal bar to divide the base into two compartments all required considerable design, testing and reworking. The lid required a complete reworking, as the initial handle failed as it was not thick enough and shattering as the rafting was removed. Timeframe: This was printed in two seperate pieces. The first was the base, followed by a seperate lid. 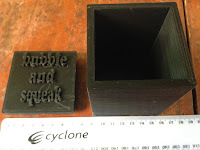 The base print meant that the lid could be resized (and subsequently was) to ensure that it fitted correctly (as it did not following the first print). The lid took eight hours, so a combined print time for both pieces was obviously eighteen hours. Given circumstances little would be changed from the original design to reduce the level of printing required. Lid in place on the base. Size: The dimensions of the box were 12cm long, 8cm wide and 6cm long. The width of the printed sides varied from 5mm to 1cm depending on the aspect of the design. The lid had similar dimensions including a drop down. What we would do differently: The lettering went right through the wall of the print - this type of design can cause problem with the rafting removal around there. An example is shown above left, if you view the inside of the 'M' the right hand side has been removed, this was by the teacher taking extreme care to avoid doing so. The fit with the lid was there - however it would have been better to have a more robust lid with a better fit. Next Steps for the Students: This design has been repeatedly completed by students including increasing complex additions to the basic design from the Tinkercad Interface. At time some of the students tend to create designs that are overly elaborate - and this was bordering on the case in this. Challenge: Student wanted to create a personalised iPad stand to support device use at home and in the classroom. Student has designed a number of prints in the past and the intention was to include significant bells and whistles to improve its design and challenge the student. Background: A completely original design, with additional features that were not included in the iPad stands that were developed earlier in the year, the link to these on this blog is here. The student who created this design and printed it is ten years old. Level of Difficulty: Medium - student wanted to incorperate a design with the stand, their name, a hole to store additional objects and have a working stand. The student drafted and initial designs were challenged to be improved to include more features not combined together. Above: iPad Stand in use. Timeframe: Ten hours. Given the size and the details in this project this represented a minimum time of print (where rafting for instance was at a minimum). This was conducted with a 8mm nozzle on a regular print setting. Size: The demensions of this print were slightly affected by the designs and not consistent throughout. The base was 15cm in length and 7cm long. The Minion design at the end of the stand was 6cm long and 6cm high. The student cleverly included his name on the head of the minion and this formed the basis of the hair of the stand. What we would do differently: Nothing - the student created something unique that was a significant improvement on the previous designs in this series, the only significant feature that needed to be improved was the location of the hole for additional storage, depending on which item was stored the iPad itself would mean that it couldn't fit. This location needed to be refined. Next Challenge for student: to relocate the hole to a place on the iPad stand where it didn't have an issue with the lean of the iPad itself. 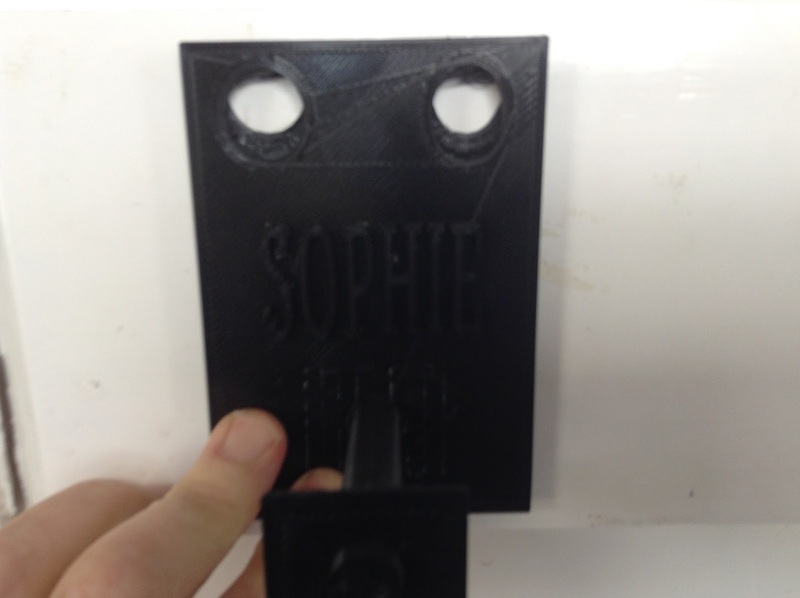 Challenge: Student wanted to design a personalised bag hook, that would be functional and personalised. This design was originally created with a 'cone' shape, testing revealed that the bag would simply slide off making the design not work. This design was created to adjust and solve this problem. Background: Student was showing creative design instincts having previously been responsible for the jewellery box design amongst others. The first design had failed, this was an attempt at an improvement to resolve the issue. Level of Difficulty: Medium. The design premise is basic, however there has already been a considerable reworking of the original design based around problem solving. There is another area that requires considerable redesign - as viewed in the photograph above you can clearly see that the screw holes in the base of the plate are 2cm across. This clearly would not work with anything other than extremely heavy and large bolts, which would not suit the purpose of this design. Timeframe: Seven hours - this design should require further refinementm the hook itself at present is 6cm from the base, the purpose could be achieved by having something half this distance. 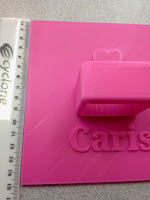 Size: The dimensions of the print are a depth of 5mm. 8cm wide, 12cm high. As mentioned the hook comes out 6cm from the base. The rectangle is 3.5cm by 3cm with a width of 2mm. The base plate has a depth of 5mm. Strength testing is required to see what weights of school bags could be held up and what the timeframe would be. What we would do differently: The task needs to undergo strength test see what weight of school bag could be held and for what length of time. The holes for the two screws to attatch to the wall need to be resized and redesigned. Next Steps for the Students: To considerably redesign the mounts for the wall and to possibly have a third screw hole at the bottom of the design. The size of these needs to be refined. There is a clear need for significant strength testing based on the size of the design, the weight of school bag that it can safely have (relative to the wall) and the length of time it will hold it for, which would be an amazing Mathematics lesson. 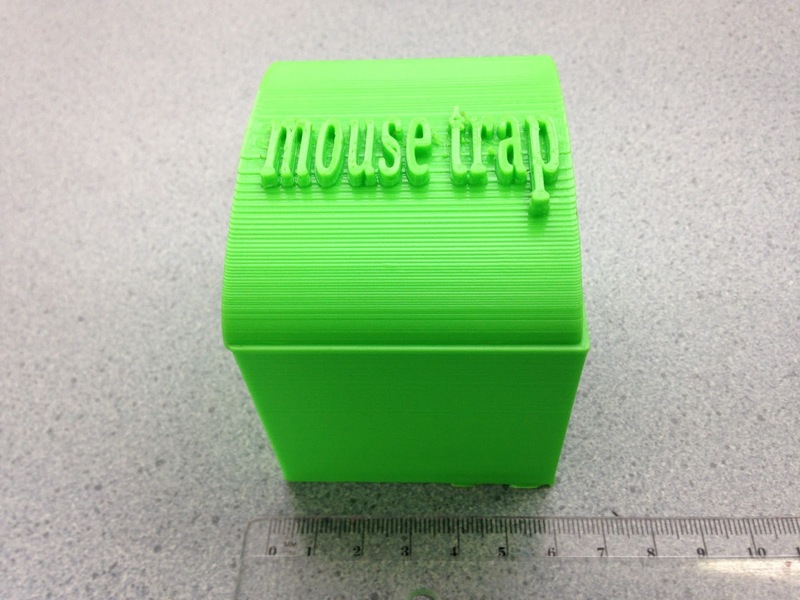 Background: Student to designed a container that would contain a working mouse trap. This would protect a domestic animal or young child from setting off the trap accidentally. This is the second version of this project, with the first featured here on this website (although this was considerably larger). 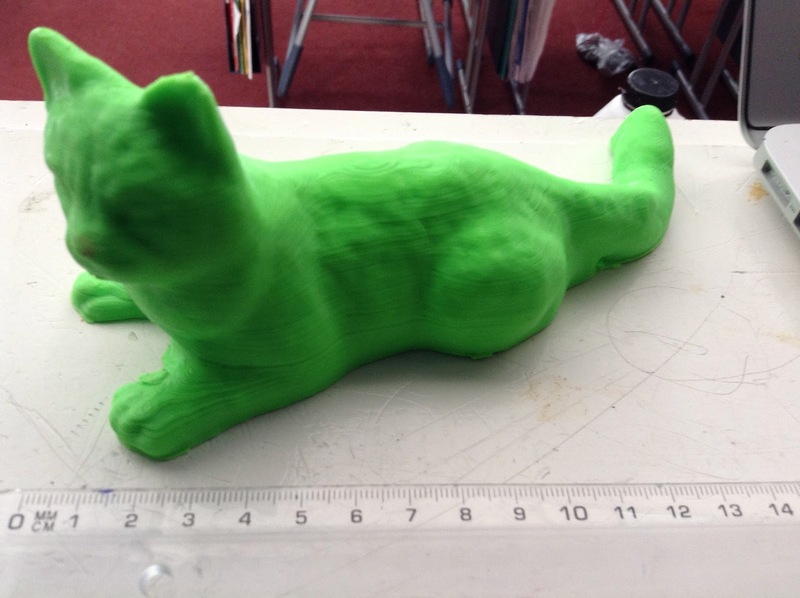 Background: This was students first individual attempt at 3D Printing by the student who was nine years old. It was for a showcase (which has featured on a number of projects that have been featured on this site). Level of Difficulty: Medium. The design was significantly large (see details of the Printing Time). The basic shape was from the Tinkercad interface wtih the addition of a hollow out section for the placement of the trap. This design was printed with an extremely large amount of 'rafting' to allow the shape to be completed. Timeframe: Twenty-Seven hours. Given this fact this was a 'one off' print this was acceptable, the print itself could have been resized given the design brief, which would have leant itself to a considerably shorter print time. Size: The dimension of this print were considerable - 15cm at the height of the roof structure. The print was 15m long and 12cm wide. The width of the walls was 5mm thick. What we would do differently: The print allowed a student to have his first experience with 3D printing and great a significant design. The student could have personalised this design with thier name either externally or internally. The shape/size came about as the result of the students experience with 3D Printers - while it worked it could have had considerable redesigning. Next Steps for Students: As above - redesigned and personalised. This variation came through Twitter today, combining an idea from a post on this blog to include it as part of the 'Movember' (New Zealand Prostrate Cancer Awareness) idea. Great stuff Nathan. Expected Print Time: Depending on Nathan's set up, nozzle size and PLA Filament in use we would expect this print to run in the forty five minute timeframe. 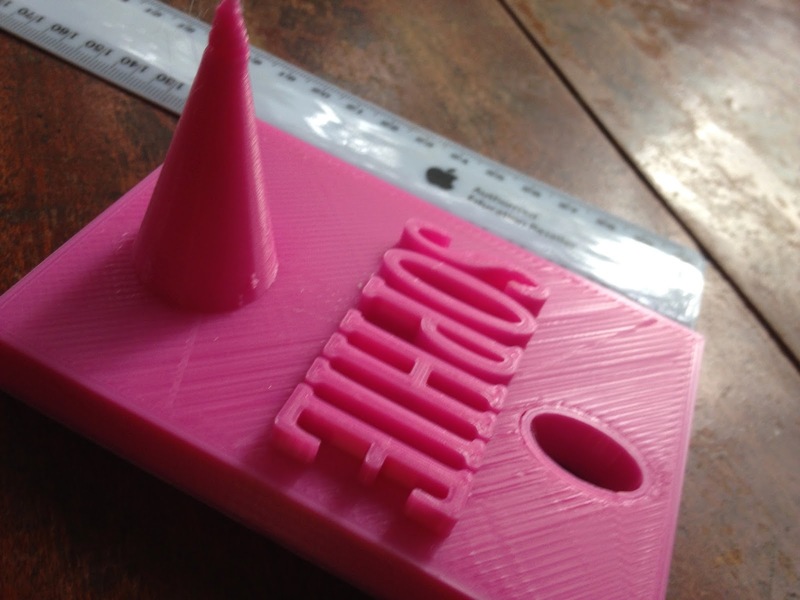 Thoughts: This will allow a group of students potentially to be exposed to 3D Printing, the print time is extremely realistic given the task and its a fantasitc idea to link it in with a relevant fundraising cause. Background: The presentations had the typical 'science fair'/board set up and we were looking at something to enhance the presentation, by adding additional features, in a 3D sense, to improve or have a point of difference. Due to the auidence (adults) and timeframe the props were for the most part used from a search on Tinkercad. These were not designed by students - they were created by third parties and re-sized and printed by the students. Left: One group was presenting about the 'Pests' in the School area. They identified that feral cats were one of the creatures and used a 'cat' search to locate this design, which was then increased in size for a ten hour print. Left: The 'Pests' group also identified Hedgehogs (which are protected in parts of Europe, but considered a pest here in New Zealand. 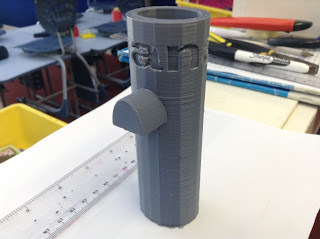 This was located from a general search by students on Tinkercad and then re-sized for a ten hour print. Left: As part of a 'Machine' themed display this student located a series of machine cogs, printed them out and then hung them from the display board to form a border. Each cog took approximately forty minutes so the tray of nine shown here was six hours altogether. Challenge: To choose suitable props to enhance a school presentation. Background: This is another task to enhance a presentation to take place for the local community and a cluster of schools. 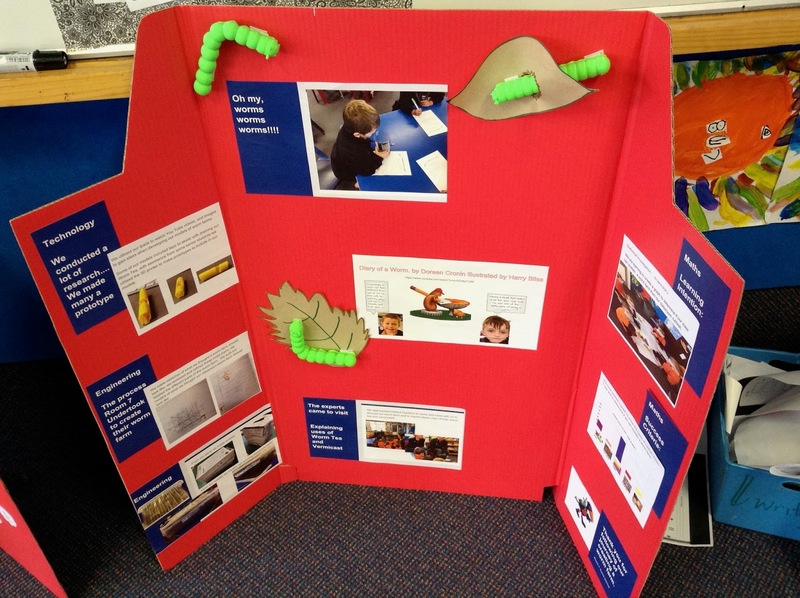 The classroom was developing projects based around two similar themes, gaden worms and glow worms. 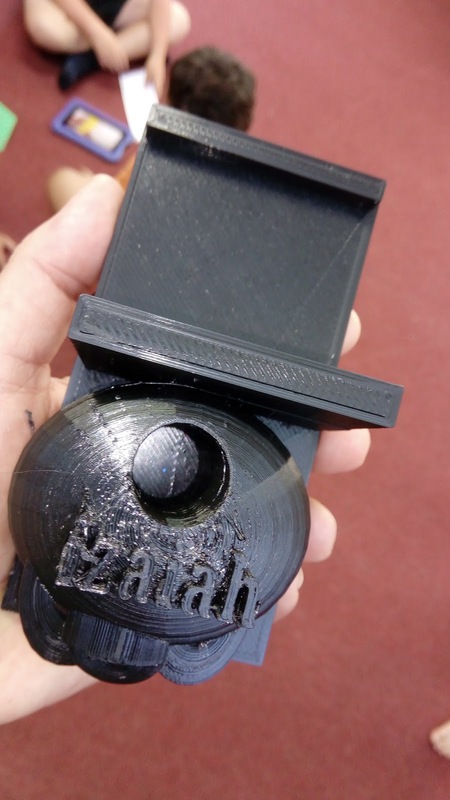 As a result of conversation with the teachers of the classrooms an offer was made to enhance the presentations by producing 3D printed models that would then be mounted on the boards. 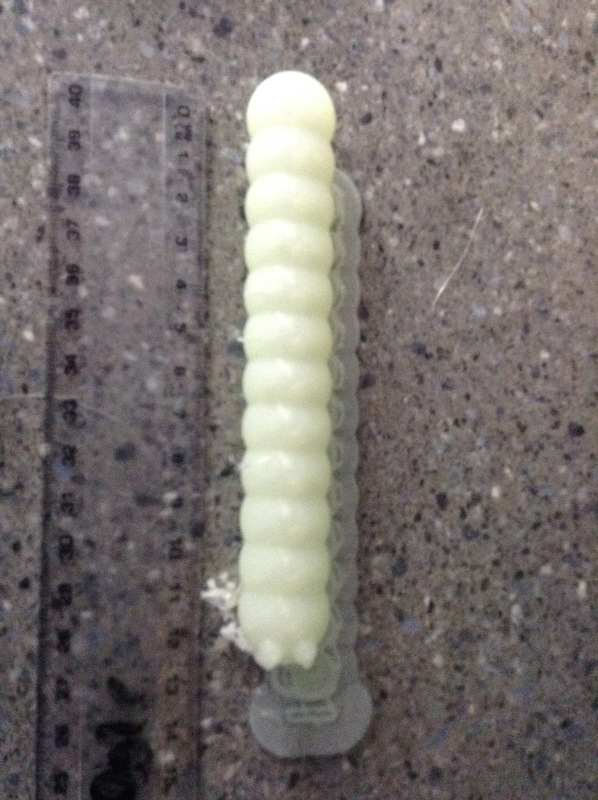 For the 'glow worm' presentation glow-in-the-dark filament was used. Due to the timeframe available a decision was made to go with pre-produced material, that was not student created. (this is the second time this has occurred on this blog, the first being the 'rat' print listed previously which is also linked to this presentation. Level of Difficulty: Minimum, none. These prints were sourced from pre-produced locations (in this case a generic search on Tinkercad) and not requiring any student created input. 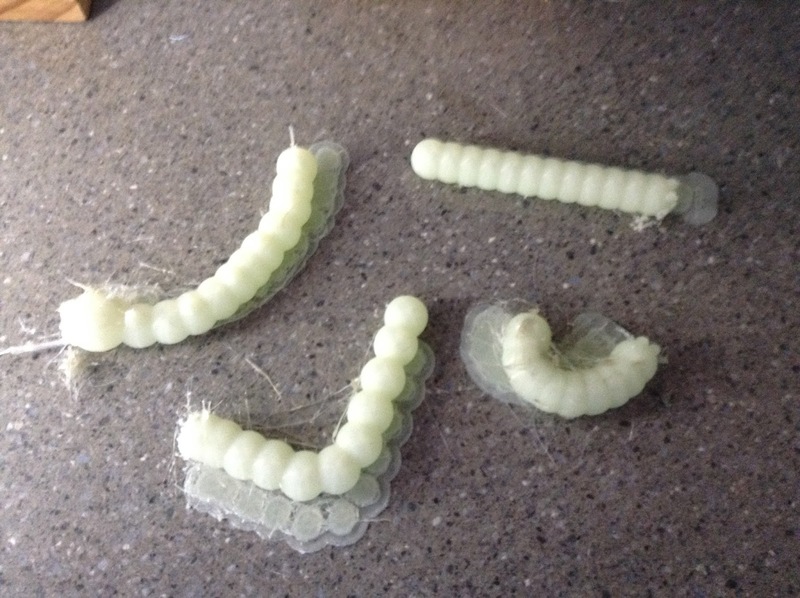 The only factor that slightly complcated matters was the use of glow-in-the-dark filament for the glow worm. This filament as a general rule is more difficult to print and requires a adjusted temperature and multiply tries to compete successfully. Timeframe: Approximately 40 minutes per worm. They varied in size and as a consequence the time for each individual piece was different. The times was a minimum required and as a sourced prints, other than altering the size, minimum changes could be made. Size: As above the size of the worm/glow-worm varies on a case by case basis. The longest in the series is shown top left, 12cm. The worms featured in the display on the right at right angles were this size but split in half due to the angle of the bend. What we would do differently; If time had not been a constraint then it would have been preferable for students to design and create their own individual and unique worms. Given what students have produced in the past, this would have been more than possible. 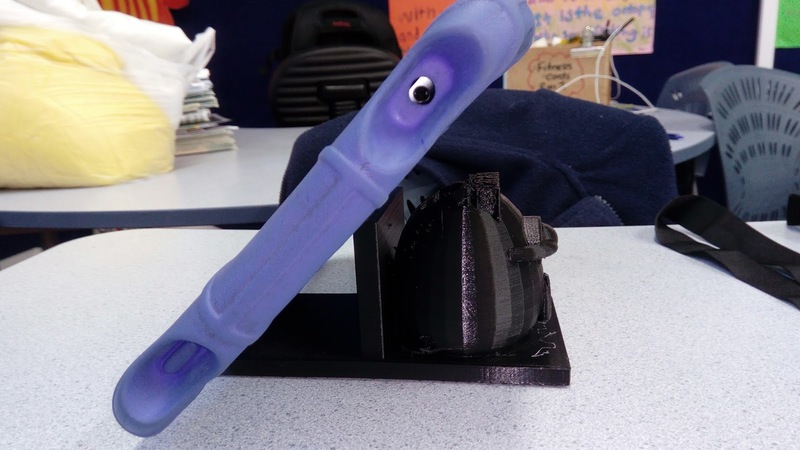 On a positive - two furher teachers were provided with practical examples of something produced with 3D Printing, and their displays were enhanced. Next steps for students: The obvious is for the students to design the worms or animals from scratch. This would be well within their capabilities and the animal shapes and design could be inspired to create their own versions that would more than suit the purpose. Challenge: To produce a working container for a School display that is functional and able to store items. Glow-in-the-dark filament was used to create a point of interest/wow factor. Container would need to feature a working lid that worked in conjunction with the base. Background: Group was looking for an item to feature as part of their display for a school and cluster (group of schools) showcase taking place for the parents and local community. The students had a background in design using Tinkercad having spent most of the year working on the projects featured on this site. Students were nine and ten years old. 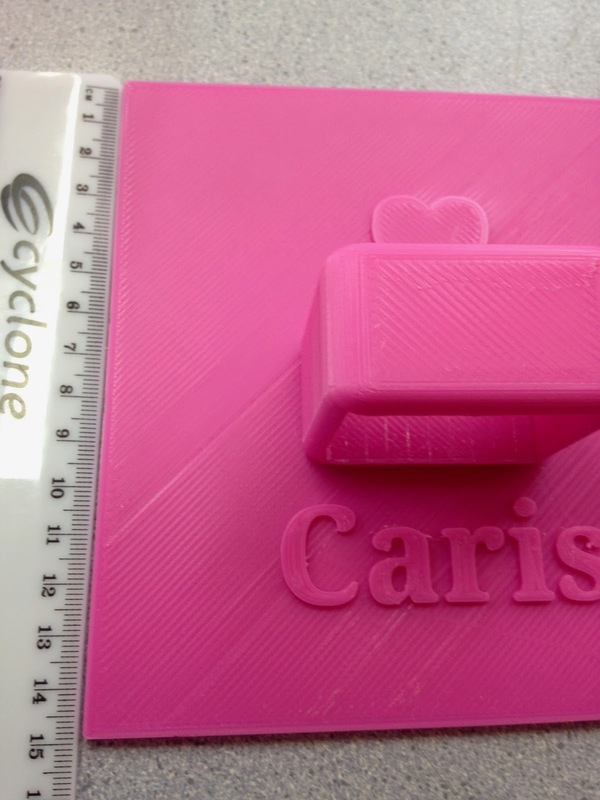 Design was created using Tinkercad and Cura for Printing. down lid on the inside and the handle. We ran the print twice to get a better result from the filament with exactly the same design and settings (this was the first of the new roll of filament). Timeframe: Six hours. Print times are exactly the same regardless of the filament used. The shape could have been slightly refined depending on the purpose of the container of what it was holding. Size: The base design was 8cm across and 8cm high. The width of the internal walls was 5mm. The lid had similar dimension being 7cm across, a 1cm depth in total (including 5mm drop down lid) the handle was 3cm high. As noted these dimensions were created by the students with the design of the container in mind rather than specific for the project. What we would do differently: The name of the students and the group that they working as part of could have been included in the design - the lid itself while it had a drop down aspect fitted losely. Both these things could have added considerably to the design and the project. Next steps for students: Research the temperature settings for Glow-in-the-dark filament and then experiment with alternative temperature to reduce the 'burn' part of the printing process shown. As noted above the container could have been more personalised. 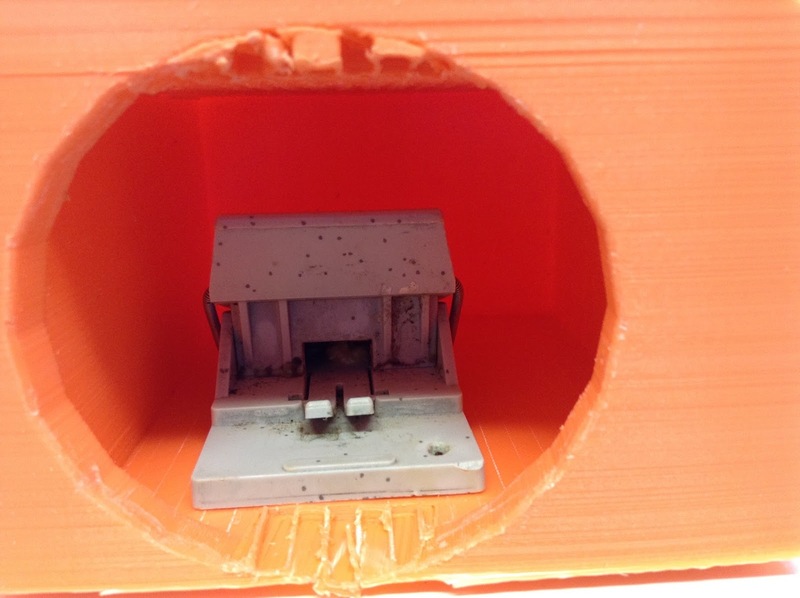 Challenge: To produce a 'Mouse Trap House' that is a structure built to hold a mouse trap to ensure that it can still activate but isn't able to be accessed by a third part such as a pet or young child. Background: Student was producing a 3D print for the first time as part of the a class project for a showcase that is taking place involving a group of local schools. Class and students had been looking at mouse traps and determined that if an animal was able to access them or a child was able to access them easily then they could be dangerous. 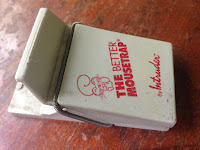 The solution was to create an orginal design that was capable of housing the Mouse Trap itself, allowing the mechanism to fully operate but would not allow the trap to accidently set off. Level of Difficulty: Medium. The design was complicated by a significant internal aread that needed to be able to house the mouse trap, with enough space for the trap to be able to spring, with the trap fitting inside it. This required the removal of considerable rafting from inside the design. 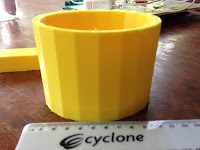 Timeframe: Ten hours of total print - the design could have benefitted from slight revision, however the internal mechanics of mouse trap and the housing goal determined a lot of the shape and size. There could have been less infill with the design. 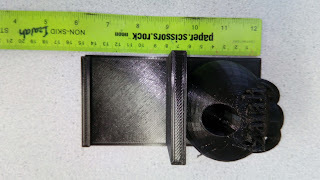 Size: The base of the design was 7cm across, the height of the design was 6cm, the thickness of the sides throughout the design was 5mm (which is pretty much the minimum required to make this print successful). 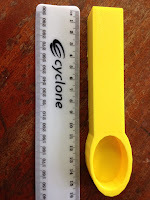 The length of the design was 6cm. The variations and specifics of the design were based to house and keep the mousetrap - which was a 'The Better Mousetrap By Intruder' brand of plastic, spring based mousetrap. This mousetrap is quite sensitive and one of the issues with it is that it could easily be set off by movement. What we would do differently: The challenge for the student was to build something that works in conjunction with a particular brand of Mousetrap. Testing is required to ensure that enough space has been produced/created to allow the spring and the trap to fully set and then release when the pressue plate is touched by a mouse. Next Steps for Students: This project is going to undergo testing as described above to ensure that it is still able to function. The idea is innovative and creative and addresses a specific problem related to the use of the mousetrap and has been student driven, created and produced - a great result. 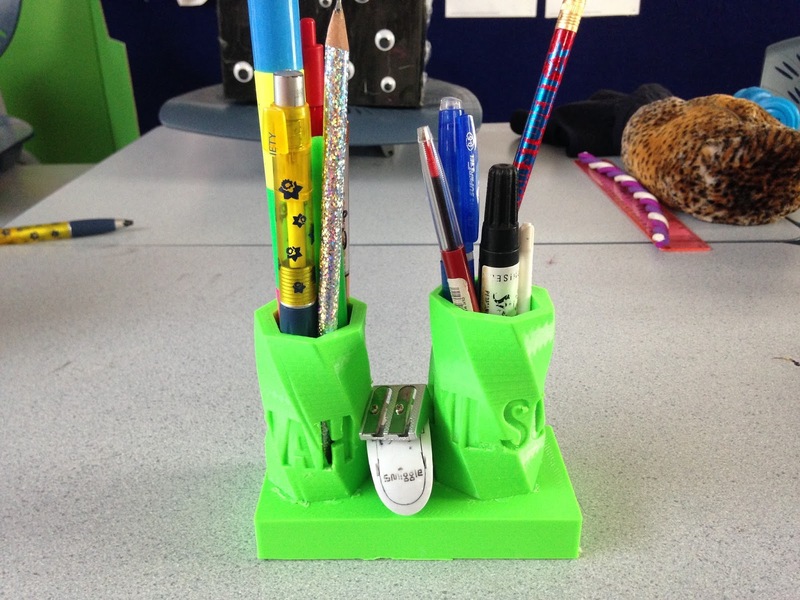 Challenge: For student to create an original design that would allow working material - pens and pencils etc. to be stored on the desk of two students with a shared design. Students creating this design were ten year old students. Background: These projects had been attempted earlier in the school year, however these students (two were involved in the design) sat adjacent to each other and as such wanted to create something that they would be able to each use. They used Tinkercad and built the designs from scratch, to personalise the design they etched or sank their names into the side of the hexagon shape that made up the storage tower. Level of Difficulty: Low-Medium. The students were personalising the design by the addition of thier names, they also used an unusual shape with the design which the class had not utilized before. The lettering was sunk lightly into the design, so the angle of the design meant some of the letters in the names were clearly visible and others were slightly more difficult to see. The students identified this as rafting at one point and 'knock it through' however this the case and it left a letter of one name looking different from the rest. Given the basic shape if they had attempted all the letters to be rafting then the design would have been considerably more challenging. Timeframe: Eight hours on a 8mm nozzle and regular print settings. There was not a lot of material that could have conceivably been removed from the print or added to it. Size: 1cm base, 13 cm wide, 7cm high. The barrel portions of the design were 9cm from the base. What we would do differently: Minimal - the only issue that developed was consistency with the lettering as it inconsistent, although this was related to the shape of the object which the students were using as a feature of the design. Next Step for the Students: More challenging projects as this was completed to the students satisfaction and not more material could be added or the design modified. 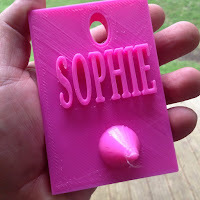 Challenge: Student wanted to create an original design - a hook, complete with their name and personalised and designed to be mounted on a wall and used to hold thier bag. The student responsible for this plan/design was a nine year old. Background: Student was following the classroom process of selecting an original project, which was created from scratch that would have a purpose. Level of Difficulty: Low. The design had three key features as shown in the photograph. Firstly a hole, which was intended to be used as the mounting hook. Secondly the name of the individual who created it and finally the 'hook' part of the design which was created to hold the students school bag. Timeframe: Four Hours. 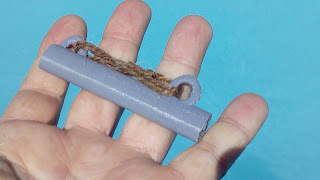 The base of the bag hook was designed featuring a 1cm base, conceivably this could have been 5mm (subject to strength testing, and the design for the hook - see below). Size: 7cm wide, 10cm high and a depth of 1cm. The lettering was raised 5mm from the base and the point of the hook itself was raised 5cm from teh base. What we would do differently: The design is essentially floored, but will turn into a learning project for the student. The idea is solid, however the project is not workable. The mounting design should have been placed in the opposite top left and right corners, rather that the middle. The 'hook' which is cone shape at present needs to be completely redesigned to suit the purpose of the print. Next Step for the Students: 'Hook' needs to be completely redesigned to meet the brief. The hole to mount the design to the wall needs to be replaced by dual screw holes as mentioned. The intention is to allow the student to test the design with a bag, which would then allow a re-design, and allow for testing on the weight of a bag to be successfully held by the design. Could potentially be used to individualise the outside of the classroom. Challenge: Students are creating a contained suitable for holding liquid. Container needs to be accessed by a lid which is able to work in conjunction with the base. 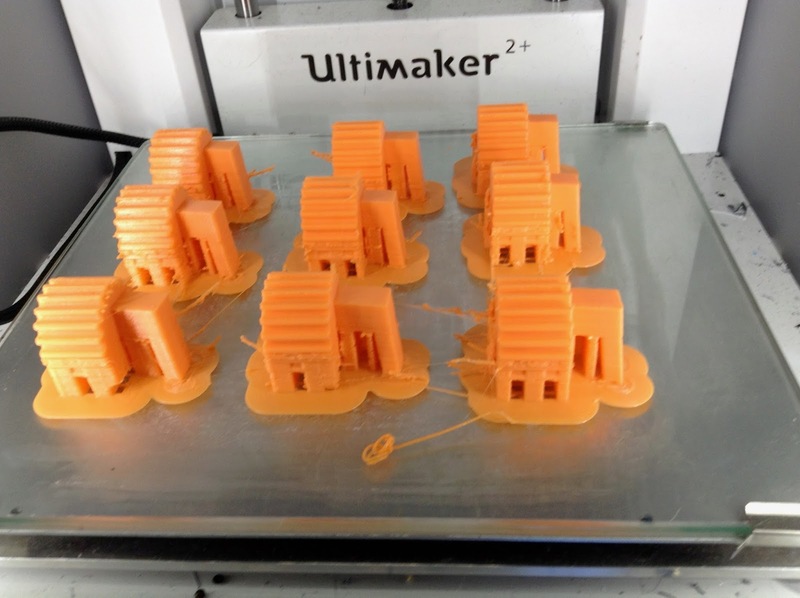 Background: Y4 Students were producing a 3D print for a student based business, which was be presented to the local community for an evening event. Students in this classroom had produced smaller versions of this previously document on this blog. Students were using Tinkercad for the first time, with the basic interface was utilized. Level of Difficulty: Low-medium. Nearly every previous print in the sequence had issues with the lid matching the base. In this case the students designed a lid that fitted perfectly. Timeframe: Ten hours were required to print the base and the lid. The size of the container had been designed by the students and perhaps could have had reduced dimensions (see below). Size: The base of the container had a length of 8cm, a width of 8cm and a height of 10cm. The width of the size was 5mm. The size of the lid reflected these dimensions with a total width of 1cm split into the lid and the drop down aspect of the lid (as shown top right). What we would do differently: Given the aspects of the design and it originating from a student creating something for the first time, it was an extremely successful print. The student was using a printer for the first time, the design features while basic meant that the student was thrilled with the results. 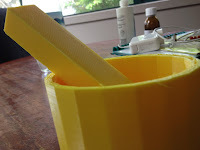 Next Step for the students: A handle could have been added to the print to allow it to be easily removed, which would have been a basic step to take, the student could have also experimented with design features. Challenge: To further develop childrens creation skills by focussing on producing a more advanced project with two parts reliant on each other and dependent on a successful print. Background: Y6 student (11 years old) is creating the first next level print that is more advanced and detailed than previous efforts. 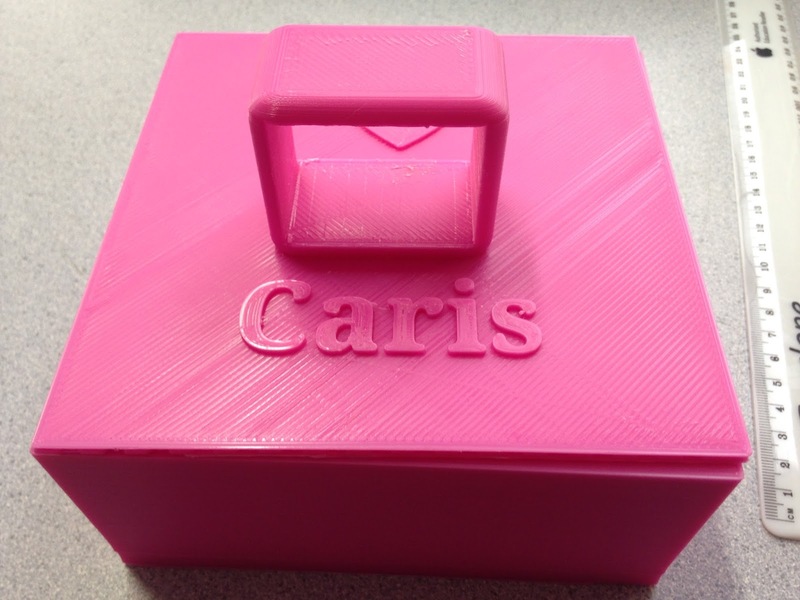 Student was using Tinkercad with assistance of other students to produce details on the lid such as the handle. Level of Difficulty: Medium - the lid needed to work in unison with the base, and the student was challenged to create multiple lids that could be interchanged depending on the use of the object. 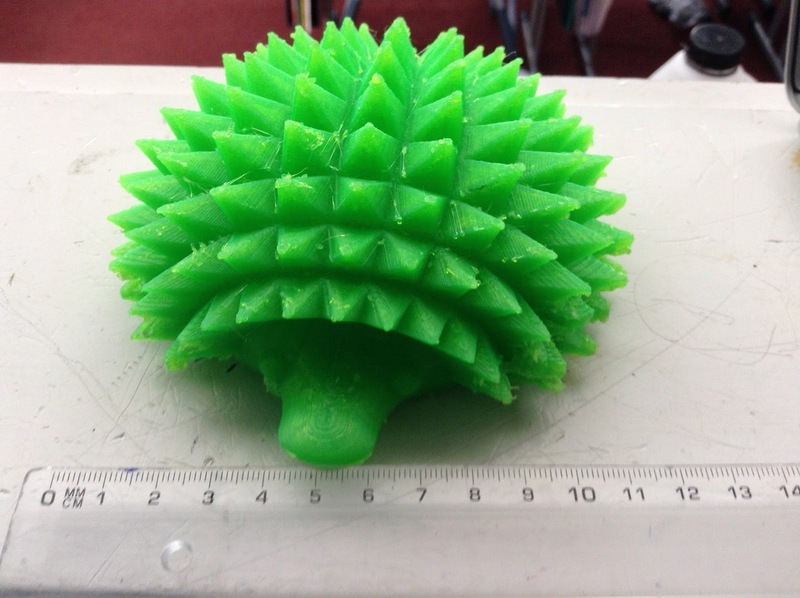 Once again all of the major elements that were the design features for this object were provided by the main Tinkercad Interface, which the student created independently. Timeframe: The base of the box was significant taking ten hours, the lid required eight hours. There could have been adjustments made to the lid shown above, to reduce the time (decrease in handle size). Size: The base of the box was 15cm wide, 7cm high and 15cm long. It had a width of 5mm. The first draft of the lid (as shown above) had a lid size of 15cm/15cm and a depth of 5mm. The handle sat 4cm above the base of the lid. The lettering was raised on slightly on the lid, 2mm. 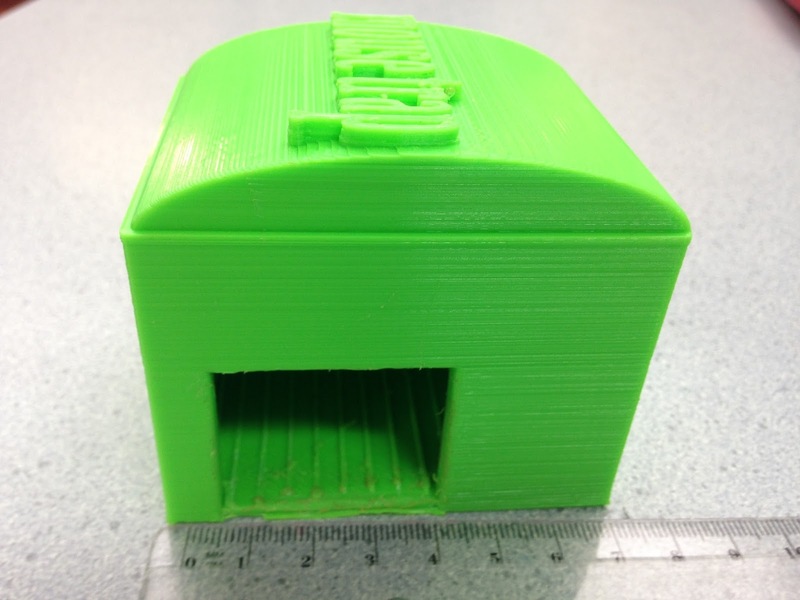 What we would do differently: There were no issues with the print itself but the students didn't initially grasp the concept of the 'drop down' lid and what potentially it meant for securing the lid. 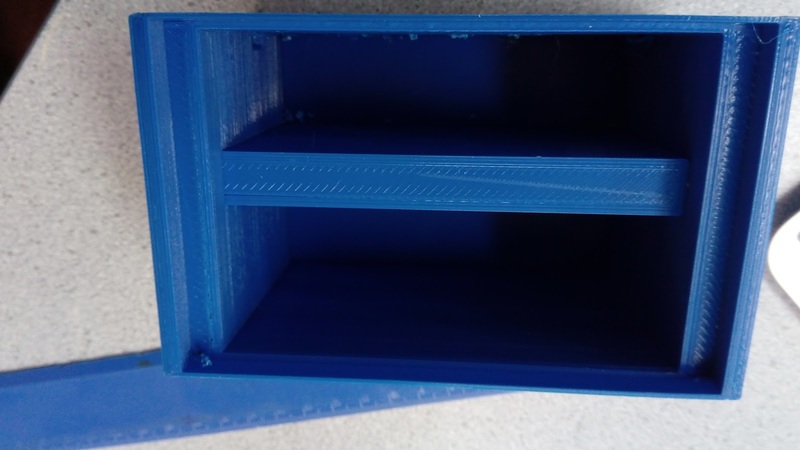 The student also made the design not to put a divider into the inside of the box, so as it stands at present it does not have inbuilt dividers that would define its use. Next Step for Students: Obviously the drop down lid, potentially more detail on the lid and internal division brackets that could define the use of the box, such as featured in the Jewellery Box design, iPod Carry Case and Edison Robot Storage Box. Challenge: This was a further development from the student led business model that was created by a class of Y4/5 students (making them nine and ten years old). The students were attempting to personally create a brand and product which could be marketd to other students. Background: Students concerned were looking at creating something striking that would impress their potential market, hence the size of the box, which was significantly greater than corresponding designs. 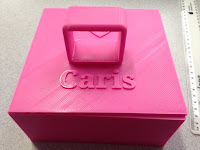 Students were creating products for the first time, using the basic designs possible from the Tinkercad Interface, without the assistance of the teacher or other students. 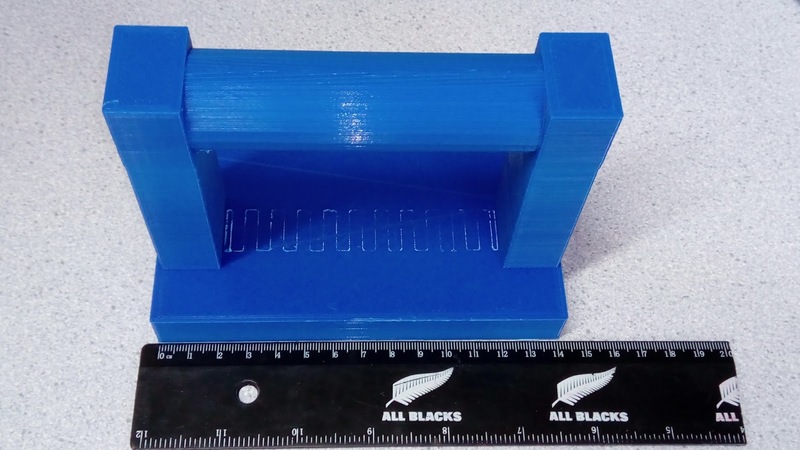 Level of Difficulty: Low - this design was created in a short space of time, using some of the basic settings available from the Tinkercad Interface, by students not familiar with the program. Timeframe: The lid and base were a combined ten hour print, the design was based around size so the details were specific to the design. Size: The base plate was 7cm wide, 7cm high and had a depth of 9cm. The width of the sides was 5mm. The lid had similar dimensions with the main part of it being 1cm. What we would do Differently: This was a starting point for the students concerned - hence the complexity of the design was reflected by its background. The students could have looked at ingraving or dropping the names of their business into the base of the box, this has been achieved to good results in recent prints. 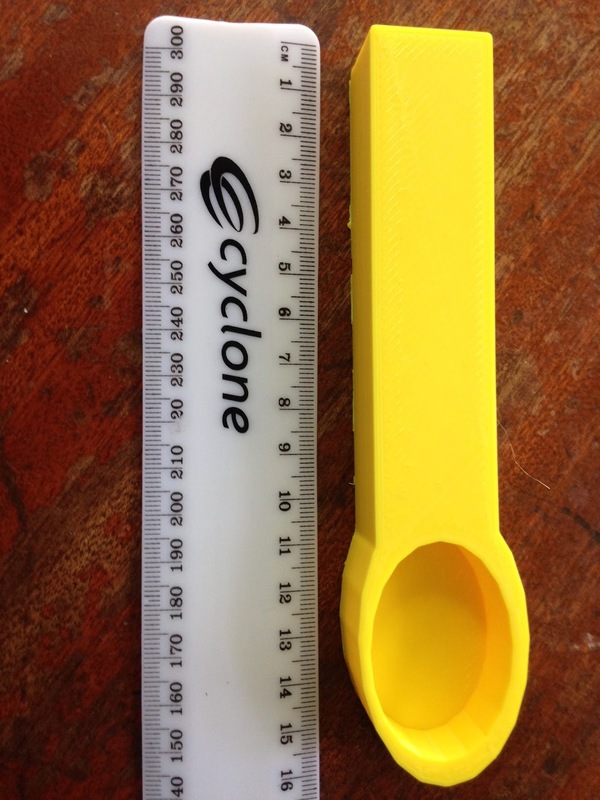 We've had students previously add additions to designs such as lids or handles and students could have considered these (they are available from the main Tinkercad interfaceand intracate designs are able to be selected easily). Next Step for students: As descibed above. Given time contraints with the project it may remain as it is. Challenge: Student is involved in a upcoming showcase of students work. The student is creating a series of products based around fragrance and hand cream. The design was to create a basic mortar and pestle set, which is described by the student as a 'spoon and cup'. The set needs to be big enough for the student to use it to manufacture/mix the hand cream. Background: The student is working with learning support with a teacher aide to produce the product. 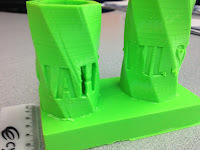 The teacher aide has not used the 3D Printer previously to produce a product, the student requires learning assistance from other students to complete set tasks. 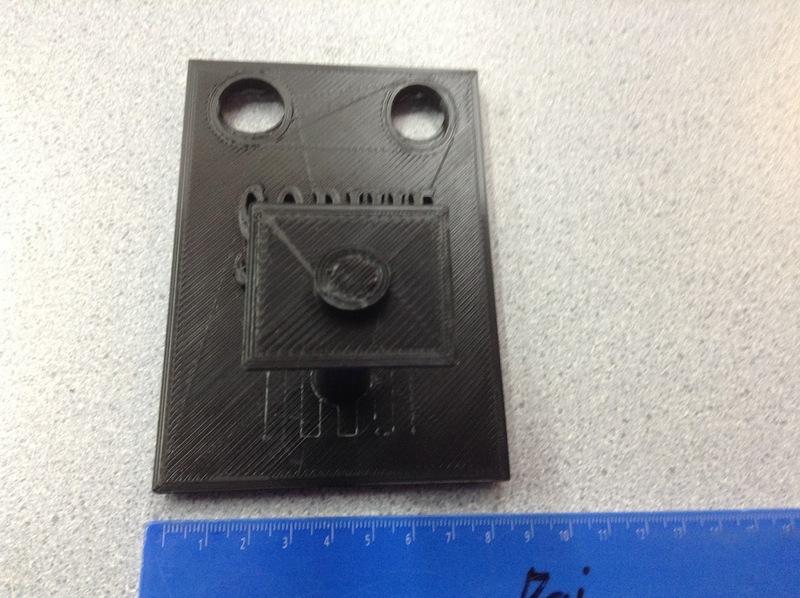 This was both (the teacher and students) first 3D Printed project. The student was a Y5 (nine year old) who typically works at curriculum level 1 (Y1 - five years old). Level of Difficulty: Low. The student was experimenting with size, design and completing the task. The basic Tinkecad interface was used to create the required shapes, which were then extended by the student by dragging them. A cup and spoon were used as a model to ensure that the size was relatively correct. In the case of the student the oversized spoon is an advantage. Size: Both prints were combined on a single run. The 'spoon' was 16cm long, 2cm high and 3cm wide. Conceivable it could have been thinner or smaller however given the student concerned the bigger item was more desirable. What we would do differently: Our class typically personalises items such as this. Clearly it would have been easy to insert the students name into the spoon and cup, or both. This didn't happen as the skill set wasn't there yet but once this print is discussed and the student spoken with (and the staff member) then other students will assist in getting it completed. Next Steps for Students: We are anticipating other students come on board to assist with the more detailed aspects of design. 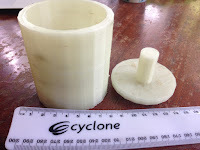 There is the obvious step of personalising the cup and spoon with either the name of the student or the business by dropping it into the cup, and then to remove rafting, as has been done on previous prints/projects.